You are about to learn why your mindset is so critical to you – it is the reason for all the success and failure you have experienced in your life. There has been a lot of discussion going on about different mindsets: what is the right mindset to have, changing your mindset, having a positive mindset, or a millionaires mindset, or a success mindset… it seems endless. So why are we presenting yet another set of mindsets. Unlike many of the other mindsets that are talked about, the fixed and growth mindsets have scientific evidence to support their existence and importance in your life. This article will explain what a fixed and growth mindsets are, why they are important, how to test your mindset and why having a growth mindset is important to you and everyone around you! “1. A fixed mental attitude or disposition that predetermines a person’s responses to and interpretations of situations. mindset. (n.d.) WordNet 3.0, Farlex clipart collection. (2003-2008). Retrieved April 21 2015 from http://www.thefreedictionary.com/mindset. So a mindset is the lens you use to interpret all the events in your life . It is the rules you have developed in your life that lets you judge if things are good or bad, happy or sad. Have you ever noticed that the same thing can happen to different people and they respond to it in very different ways? That is determined by their mindset! Your mindset is created by all the beliefs you have about life and the people in your life. It is the summation of your beliefs about yourself, your abilities and capabilities, how things “should” happen in your life, what you deserve,… Your mindset is created by all of your beliefs! And these beliefs are the result of the events in your life and how you were taught to interpret them by the people around you… not only by your parents but by teachers, friends, relatives and others. Why is a Mindset Important? A mindset is what causes you to react in certain ways, to do certain things, to think certain things and ultimately be the person you are. Every time anything happens to you, you have habitual things you say to yourself and others, things you think and do and these are the things that shape your life; these things are controlled by your mindset. Your mindset is that little voice in your head that directs your thoughts. For example, if you failed a math test in school did you say “I’m just not good at math” or did you say “If I work harder, I can do better.” If you failed to stick to a diet did you say to yourself “I can never stick to a diet” or did you say “Forget diets, lets just start eating healthy and the rest will follow.” Your mindset determines what you say to yourself about what is happening to you, how you interpret it, the resulting actions you end up taking and what you end up doing in your life. The concept of mindset is groundbreaking because it explains so much about people. It explains why very talented people don’t always succeed. It explains why praising the intelligence and talent of people do not create self-esteem and success in these people but actually puts these people at risk of failure. It explains why all truly successful people are successful and what they know. Carol Dweck, a world-renowned Stanford University psychologist, discovered the concept of the two fundamental mindsets: the fixed mindset and the growth mindset after decades of research. There is now a large body of research generated by people like Carol Dweck and others that demonstrate the existence of these two mindsets. These mindsets are the basis for all the other mindsets that people talk about! In Carol Dweck’s book, Mindset: The New Psychology of Success, Dr. Dweck explains in detail the research that exposed these two mindsets and their importance to overall success of students and adults. Her original research focused on students and their ability to do puzzles that got more and more difficult. She discovered two groups of students, those that enjoyed being challenged by more difficult problems than they could easily do (growth mindset or incremental learners) and those that did not (fixed mindset or entity learners). She and others have conducted an extensive amount of research that solidified the existence of these two mindsets. 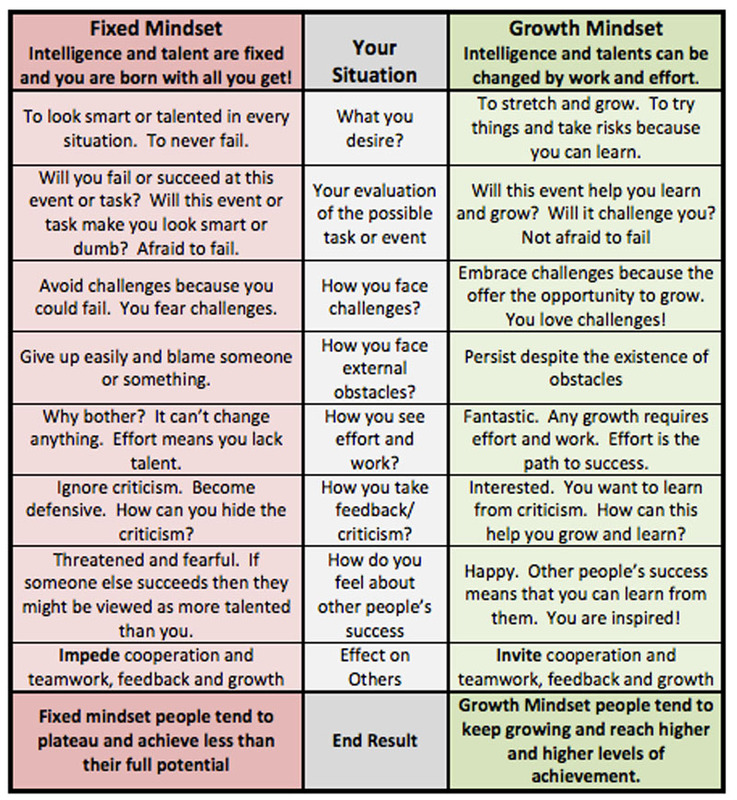 There are many differences between fixed and growth mindsets. A detailed summary is presented in the table below. In general, people with a fixed mindset believe that their basic qualities and strengths are fixed. They are born as smart and talented as they are going to be and nothing they do will change that. They feel that successful people are born with a talent in the direction of their success otherwise they could not be successful in that area. Work and effort mean that you are not talented or smart. If you do not succeed then you are a failure. In order to feel good about yourself and your outcomes, someone has to tell you that you are good at what you do – you are talented. You tend to surround yourself with people who tell you how smart or talented you are. People with a Growth Mindset believe that a person’s abilities change depending on the effort they put into changing them. If they put effort in then their abilities increase, if they don’t put effort in then their abilities stay the same or decrease. They feel that a person’s ultimate true ability is unknown. 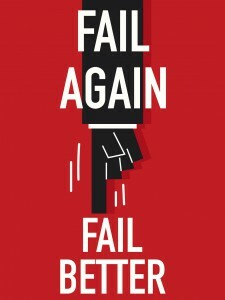 If you do not immediately succeed, then you can learn from your experience and try again using the new information. Your sense of self worth comes from the process of growth and learning not from external sources. You tend to surround yourself with people who help you grow and learn. It is not that people who have a growth mindset do not believe in talent, they know that natural talent exists. But they know a more important thing: that natural talent can only take you so far. It might give a person a head start but in the end, natural talent is rarely enough to keep a person successful over the long hall. In the long run, work and effort play a more important roll in success. The most important thing is that you answer the questions completely honestly because there is a tendency of someone with a fixed mindset to not want to “fail” the exam – so to speak. This is your future you are trying to determine, answer honestly! Another thing to be aware of is that you might not have a fixed mindset about every aspect of your life. You might have a fixed mindset about your ability to learn a language, or in relation to trying a new career but a growth mindset about your ability to learn how to cook. Once you know your mindset you can think about what you want to do about your current mindset – because, of course, you can change it!